AFTER years of controversy, it has finally been decided that Northampton will get its marina in Becket's Park on the Nene. £3.5 millions to replace log cabin! DUDLEY Canal Trust have just published its plans to replace its 'log' cabin at the entrance to Dudley Tunnel with a £3.5 millions centre. THE police are hunting a middle aged vandal who they believe is responsible for destroying canalside signs. NEARLY half a million pounds is being spent on maintenance work on the Huddersfield Narrow this winter. CANAL side sculptures seem to be a target for vandals, with now another being wrecked. IT WAS a rusted jubilee clip that caused a boat moored on the Thames to fill with water and sink. A VEHICLE damaging Hapton Bridge on the Leeds & Liverpool Canal has resulted in its closure. 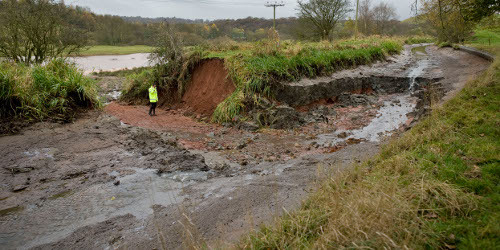 IT HAS been estimated that 21 million gallons of water escaped from the canal as a result of the breach on Thursday, flowing across agricultural land and into the Churnet. THERE has been a Category One—the most serious—diesel spill into the Calder, that is causing concern. BRADFORD Council will take a stake in a £500 millions canal corridor plan that will see massive development along the Leeds & Liverpool Canal.